If there's one thing I've learned from the regular Call of Duty: Advanced Warfare trailers we've been getting over the past few months, is that there needs to be more Kevin Spacey in video games. Let's fix that. Why are we limiting one of America's finest actors to a single virtual stage? Not everyone enjoys playing Call of Duty, and as a denizen of the internet I feel it is my right to call that completely unfair to the rest of us. I'd start a petition, but figured a 'Shop Contest would be a lot more fun. 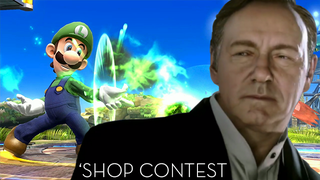 Which games would Kevin Spacey fit in? What kind of question is that? All of them. He's a new Super Smash Bros. competitor. He's a Need for Speed car. He's a Tetris piece. Whatever Kevin Spacey wants to become, he becomes. By applying completely false logic to that truth, whatever you want Kevin Spacey to become, he becomes. Here's a transparent PNG file I pulled from one of those aforementioned trailers. Not the right Spacey? You might find some more images in Google. That Google has everything. Your task is clear. Go forth and Spacey-fy all of the games.